MILAN, like many another centre of lacemaking, was early famed for its embroideries. In 1584 a " Universita " of embroiderers was already in existence, and flourished until the middle of the seventeenth century. Coryat mentions that the Milanese embroiderers are " very singular workmen, who work much in gold and silver." Milan point was justly celebrated in the seventeenth century. Lace was, however, known and made in Milan at a much earlier date. 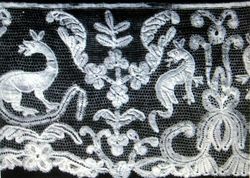 The earliest record of Italian lace known belongs to Milan, being the document setting forth the division of personal property between the sisters Angela and Heppolita Sforza Visconli in 1493. Henry VIII of England is mentioned as wearing an edging of lace of purple silk and gold worked at Milan. In a wardrobe account of the wife of James I. (1606) is noted—" One suit, with cannons there unto, of silver lace, shadowed with silk Milan lace." In the middle of the eighteenth century the industry had fallen into decay. "The Milanese," writes Lalande, "only fabricate lace of an inferior quality,"* to which may be added the later testimony of Peuchet, who writes that the laces are very common and not highly priced. 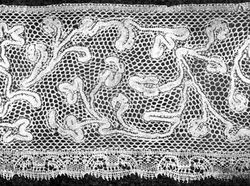 The earlier Milanese laces are not grounded with the reseau, but covered by bold rolling scroll designs held together by brides, sometimes of twisted strands of thread. The reseau ground was introduced by 1664, at which date a portrait by Gonzales Coques shows a straight-edged piece of Milanese with meshed ground, The reseau is of various kinds. Its most common type is a diamond-shaped mesh, formed with a plait of four threads like Valenciennes, but many experimental grounds, loosely worked, are met with in earlier pieces. Sometimes the mesh is square with the threads knotted at the points of intersection. The pattern is first made on the pillow by itself, and the reseau ground is worked in round it afterwards, sloping in all directions to fit the spaces,while Valenciennes is worked all in one piece, pattern and reseau together. The designs are beautiful, and consist of light ribbon-like scrolls and conventional flowers, which enclose small chequer or other simple fillings. Animal forms, eagles, hares, bears, hounds, archaic in drawing, but always vigorously treated, are frequently introduced. Coats of arms are frequently met with animals which represent family badges. The double or imperial eagle is of very common occurrence. This is to be accounted for by the fact that Charles V conceded as a mark of special favour the privilege of bearing the imperial arms to several Italian families, who used them instead of their own arms.